Wow – is anyone else in awe over how fast this summer seems to be passing? I can’t believe it is August already and school will be starting in a couple of weeks! My family and I just got back from our yearly pilgrimage to Capitola, California. We have a great time there, and for about 4 days I completely don’t care about schedules, chores, or bedtimes (ironically all of us ended up in bed by about 9pm every night – haha). Although I always care about eating good food, I must admit that on our little family vacays I let a lot more treats slip in. Not that treats are a bad thing anyway – I just know we get more in than we should, even if it’s high quality. So when I get home, I usually have 2 things on my mind: #1 laundry, and #2 get some healthy, clean, fresh food in my family’s tummies! This recipe is based off one that my grandmother made and my family has loved for years. Everyone in the family kind of has their own version that they make for themselves and this one is mine. I love this salad and I am NOT a “salad is a complete meal” person. But this one has charisma. It hits all the points on your tongue – salty, sweet, creamy, crunchy, fresh & astringent, slightly spicy. It’s got it all. It’s actually a very low calorie meal too, including the dressing. I entered it in on a calorie calculator a few years ago and for a huge serving (2 cups) it was only 214 calories! More importantly, it has wonderful nutrition and tastes amazing! Now I didn’t include meat in this recipe, but this is a great way to use up leftover steak or chicken (as I did on the pictures) or seafood. Shrimp would be amazing, salmon too! I also left cheese off. Cheese is delicious on it (I like to use an organic whole milk queso fresco or a Monterey jack). So if you want cheese – please have it! Add anything else you like! I love to hear other people’s versions of this so if you come up with anything awesome – let me know! I did this recipe on my BradyMunch blog awhile ago in greater detail. But it’s so easy – pretty much assemble and EAT! 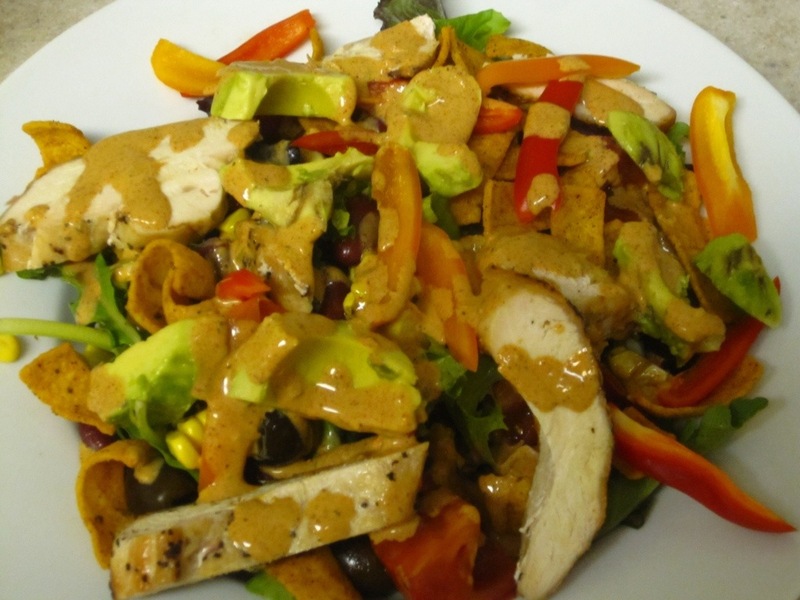 You’ll notice there are a lot of canned ingredients in this salad. I love certain canned things as I can always have them on hand for when the fresh stuff spoils or I hadn’t made it to the store for fresh produce re-up. I just make sure that none of the foods are canned with chemicals. Just check the ingredient list first. If you have a preference by all means get it. I like romaine the best for this particular salad. It stays crisp longer and is very versatile. I picked black beans because my husband loves them and kidney because that’s what my grandma always uses. Use whatever beans you like! The olives don’t have to be black or canned by the way! You can use fresh (I like to grill mine on the cob then cut it off for this salad – see my BradyMunch post on this for corn grilling instructions), but frozen or canned corn is totally acceptable in this! 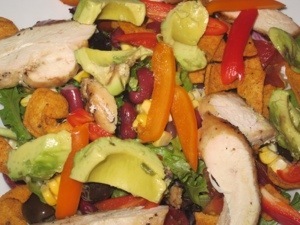 My grandma uses good old Fritos (the chili cheese ones) and I must admit I love those on this salad. But I also use healthier versions or bake my own. It’s up to you! A squirt of fresh lemon juice will keep them from oxidizing (turning brown). I like the English ones because the skin is thin. No need to peel. Actually I almost NEVER peel my vegetables. You throw out so many nutrients when you peel. Unless it has to be peeled to be eaten – I say leave the skin on! Obviously nonfat is optional. You can also use sour cream – the Mexican crema is fantastic in this. I like to use olive oil mayo. This may seem like a lot but remember it’s a lot of dressing. These will give a slight spice without adding heat. It also freshens and brightens a creamy dressing. An optional ingredient for this would be to put the avocado in the dressing. It will add delicious flavor and richness. A pinch of cumin would be good too! Put all the ingredients (start with ¼ cup milk) into blender and blend on high until smooth. Do a taste test. Add any needed salt or chili powder. If dressing is too thick, add more milk and blend a couple tablespoons at a time until desired thickness. Pour into sealable container & refrigerate until ready to use. If I am not serving this to a crowd I like to take all those canned ingredients and keep them in a container in the fridge together. Then I can make individual salads all week, assembling one or more whenever I want. In a large serving bowl pour about 2/3 of the dressing on the bottom. Top with the greens, tomatoes and chips. Toss until dressing is evenly distributed. Sprinkle the remaining ingredients evenly over the top and serve. Thanks so much for visiting me this week! I hope you try this and/or any of my recipes. And if mine don’t work for you then find some that do! Just try to do what you can. It’s pretty hard to completely change overnight. If you are just starting out, take baby steps – eventually you will get there. Try just cooking one time a week and increase as you go. And I am always here, happy to help answer any questions you have. Thank you for reading my recipe! I will add a printable version of this recipe without all my witty repartee (ha-ha!). I hope you enjoyed it enough to try it! DISCLAIMER: All recipes are just a jumping off point – unless I specify otherwise, all ingredients or amounts are changeable. If you don’t like it, then don’t use it! If you don’t have it, then check your cupboard for a good sub. Remember – if you buy junk ingredients, your end result will taste like junk! That being said, quality doesn’t always mean more expensive!! And most important of all, bring some pleasure into your kitchen – have some fun while cooking! Put on music, get the family involved (family dinner time doesn’t just have to be at the table! ), find things you like and enjoy the adventure. If I can do it, you can definitely do it! And if you mess up, then make some PB&J and try again tomorrow. Mistakes and disasters are part of the journey. Don’t let a mistake or the possibility of one stop you!